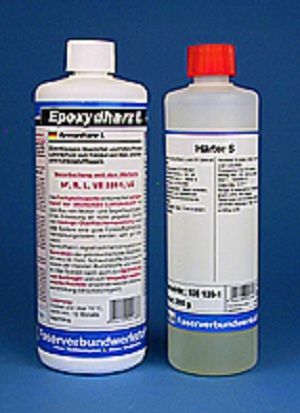 Epoxy Resin L + Hardener S, kit/ 280 g.
New Quality: free of Nonyl phenol and Benzyl alcohol. Curing starts at 5 °C. Epoxy resin L with the corresponding hardeners S, L, EPH 500, EPH 161 and W 300 is the most commonly used laminating and adhesive resin in the R&G delivery programme. In conjunction with the hardeners S (15 minutes), L (40 minutes), EPH 500 (60 minutes), EPH 161 (90 minutes) and W 300 (300 minutes), this epoxy resin exhibits strengths similar to those of the laminating systems usual in aviation. The heat distortion temperature ranges from 60 °C (S, L, EPH 500) to approx. 120 °C (EPH 161, after heat curing). Expertise for the resin systemepoxy resin L + hardener S: this system is not cytotoxic (cell damaging), important for applications in medical purposes!